Kevin Harvick started first and finished second, scoring nine bonus points. The No. 4 Busch Light Ford jumped out to the early lead to start the race and was in the lead during the race’s first competition caution on lap 30. Harvick pitted for four tires and fuel and resumed in third, then moved up to second on the ensuing restart on lap 34. On lap 50, Harvick reported he might have a right-rear tire going down. That turned out to not be the case, as he was fighting a loose condition off the corners. He held second place and was battling for the lead at the close of the stage but came up just short. The No. 4 Ford came to pit road at the conclusion of the stage for fuel and air-pressure adjustments and won the race off pit road. Started first and finished second to earn nine bonus points. Harvick reported a possible vibration on lap 108, but no issue was found as he remained in the lead. The Busch Light Ford pitted on lap 124 for four tires, fuel and an air-pressure adjustment and resumed seventh. Harvick retook the lead on lap 129 but fell to second two laps later when Kyle Larson completed a pass. Harvick brought the No. 4 Ford in at the end of the stage for four tires, fuel and air pressure and wedge adjustments and resumed in second place. Started second and finished first. Harvick came to pit road under green on lap 213 for four tires, fuel and an air pressure adjustment and was third when the field cycled through that round of stops. The caution flag flew on lap 236 with Harvick in third. He pitted on lap 238 for four tires, fuel and air pressure adjustments and resumed in second. Harvick pitted under caution on lap 248 for four tires. He restarted eighth as six cars ahead of him either stayed out or took just two tires. Harvick had worked his way up to sixth when a multicar accident brought out the red flag on lap 253. He restarted sixth when the race went back to green with nine laps to go and gradually chased down Martin Truex Jr., passing him for the lead with a lap and a half to go. This was Harvick’s fifth victory, ninth top-five and 10th top-10 finish of 2018. This was Harvick’s 14th career Cup Series win on a mile-and-a-half racetrack. Harvick finished second in Stage 1 to earn nine bonus points and second in Stage 2 to earn an additional nine bonus points. Harvick led five times for 79 laps to increase his laps-led total at Kansas to 675. 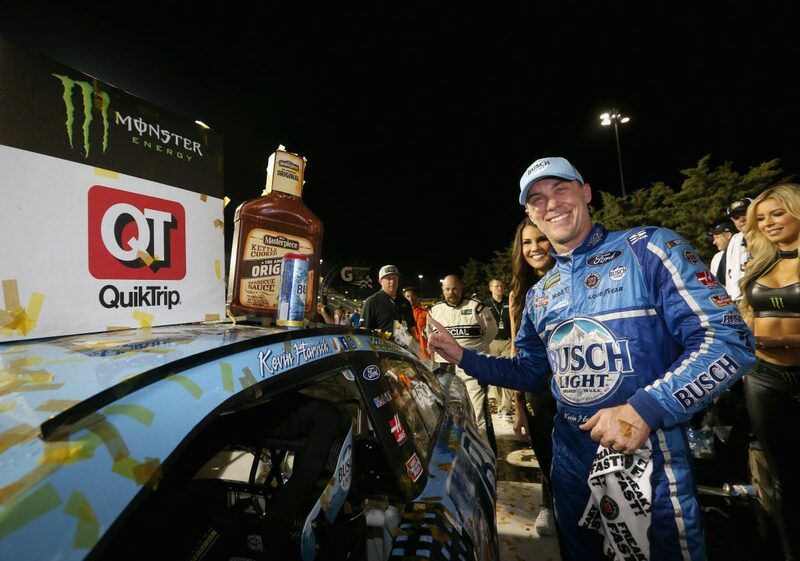 Harvick’s victory in the KC Masterpiece 400 marked the 49th overall win for Stewart-Haas Racing (SHR). It was the organization’s 45th points-paying Monster Energy NASCAR Cup Series win and its third at Kansas. Saturday’s win marked SHR’s sixth victory in the first 12 races of the 2018 season. This was SHR’s ninth Cup Series victory with Ford. This was Harvick’s 42nd career Cup Series win and it keeps him in sole possession of 18th on the all-time Cup Series win list. This was Harvick’s 19th Cup Series victory since joining SHR in 2014. Only 15 of the 38 drivers in the KC Masterpiece 400 finished on the lead lap. “I think, as you look at the last couple of laps, it wasn’t working for me on the bottom, and I was able to make up some ground on the top; and really, I thought, if it came down to it I could pass him on the bottom because my car went through one and two on the bottom or I could drive through the middle of three and four, but I just had to pick which a lane. He wasn’t going to choose, and he never chose the high lane, and we were able to drive right by.